Let us design & build your grow-lights, with your branding. EconoLux OEM, Semi-Custom, Custom and Bespoke LED Grow-lights department provides you with the opportunity to lunch your own brand of LED grow-lights. We have designed and/or manufactured, long life-span, energy efficient, LED plant grow lights for a number of international clients. We treat this work as CONFIDENTIAL and do not reveal who we are making lights for. The examples shown below have had the photos purposefully blurred, and the brand names and identifying marks removed, so as to preserve our client's confidentiality. We can make any type of LED grow light from the lower cost Blue/Red and Blue/white/Red, fan cooled, home growing type lights, to professional, passively cooled, waterproof lights, to clones/copies of popular professional LED grow-lights. 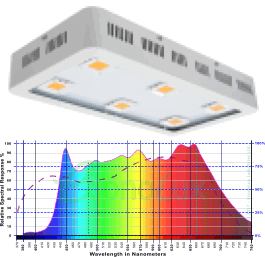 The lights can be made with your choice of spectrum, up to and including our full-spectrum technology with close match to natural sunlight. The lights can be finished in your colour scheme, with you branding and model numbers printed onto them, so as to be completely your brand (MOQ applies) - we won't tell anyone we make your grow lights. 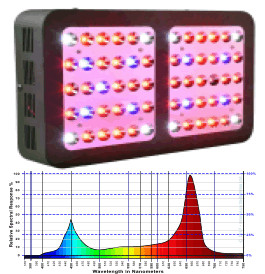 The customer wanted a classic style of blue/white/red LED grow light, with a 'good enough' spectrum that the light could be billed as a 'full spectrum' grow-light. The customer wanted fan cooling, and other design features for the home growing market. The customer was also price sensitive as he planned to sell the lights though a major on-line sales portal. EconoLux successfully created a prototype, and after customer approval, designed and built the light for the customer, on time, and on budget. The customer went on to sell more than 1,500 lights through the on-line platform, and made a significant profit. The European client wanted a grow light based on our VSX full spectrum COBs. Their requirements were to have 600W of output power with CE approval. They would sell the lights directly through their network of distributors, and were aiming at the home and semi-pro markets so they wanted fan cooling and a traditional/typical looking housing. Since the spectrum is established by the COB, EconoLux simply had to manufacture suitable housing, modified to accommodate 6 COBs, and we had a prototype made in a matter of weeks. The project was delivered ahead of schedule and on budget. 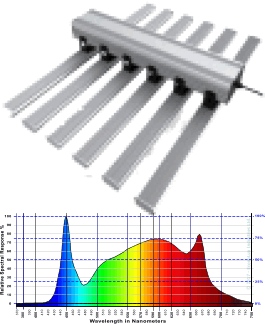 A commercial tomato glass greenhouse in Lithuania wanted a passively cooled supplementary LED light for their operation. The lights had to be mounted up high so there was clearance for machinery to move about unobstructed. Accordingly, we recommended a COB based solution as it could be fitted with 45 degree or 60 degree glass lenses to insure the light reached the plants. EconoLux tested several iterations of a COB to insure the spectrum was correct (spectrum not shown as it is confidential). Once this had proved successful, we built 100 pieces for a medium scale grow test. The results, after two growing cycles, were that the crop yield was increased by 18% to 22%! The customer is now planning to outfit his whole operation with about 5,000 of these custom lights. This grow-light manufacturing company wanted to make a copy of a popular US style 'white light + red' LEDs grow light - but not a close enough copy that they would get sued. EconoLux set to work and designed the extrusions and other parts for the housing. We 3D printed full-size parts from nylon and plastic to insure that everything would fit together properly. We did the designs for the PCBA boards, built and tested prototypes, adjusting the LED assortment until we had a close match to the desired spectrum. 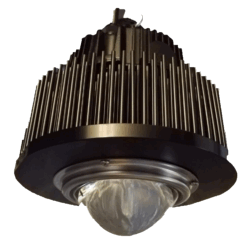 We chose MeanWell drivers for this project as they are high quality and available with dimming and DALI options. Once the project was completed, and the client had approved all aspects of the project, it was ready for manufacturing. We turned over all the drawings, 3D CAD models, and prototypes to the customer so that they could produce the product. We manufacture the PCBA LED boards in bulk for the customer, who integrates them into their lights. We have the skills and equipment to make almost any style/type of fan or passively cooled LED Grow-Light. We have done this for others, let us do it for you!